This wonderful garden in Dumfries, Scotlandd is open to the public only one day a year. I’d love to visit it; but until I do there’s an online gallery of images: The Garden of Cosmic Speculation by Charles Jencks. 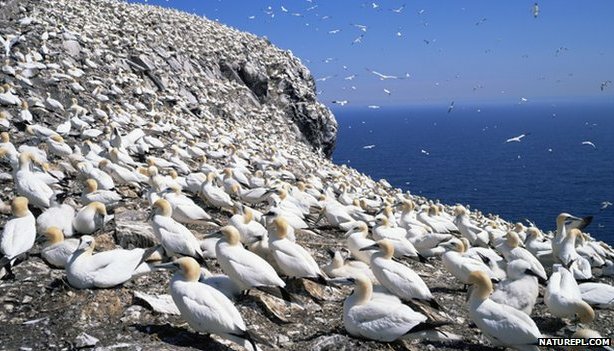 The BBC has a quick overview of some of Britain’s largest and best nesting colonies of seabirds: Seabird spectacular. Was Stonehenge the United Nations building of its day? The UN building in New York was made with the finest materials contributed by countries around the world to celebrate their cooperation. Researchers now think that Stonehenge was a symbol of the united tribes of Britain. I’m going through old books at home, currently a stack of “Horizon,” a hard-backed quarterly from the American Heritage Publishing Company. (The contributors range from Arnold Toynbee to T.S. Eliot. I’m reluctant to send them to the Goodwill.) The Spring 1976 issue contains “The Stately Mansions of the Radiolaria,” by Stephen Jay Gould. Ernst Haeckel was the Thomas Huxley of Germany. A brilliant and indefatigable writer and lecturer, he became the continent’s chief publicist for evolution. His books certainly had a greater impact on the general public than those of Darwin. He is best remembered today for his intriguing, but basically incorrect theory that “ontogeny recapitulates phylogeny”—that is, that individuals repeat the stages of their evolutionary ancestry during embryonic growth…. Haeckel also introduced a multitude of terms into our biological language—”plankton” among them. in his own day, he was a force to reckon with. He railed against the established church and the privileges of aristocracy, and hoped to establish an evolutionary humanism as the basis of ethical judgment. But when he was not fighting his cosmic and romantic battles, he liked to work on the taxonomy of radiolarians, for he was overwhelmed by the beauty and variety of their shells. He wrote an illustrated an enormous monograph to describe the radiolarians collected by a famous scientific expedition, the voyage of H.M.S. Challenger in 1872–1876. In his monograph of 1877, Haeckel could do little more than catalogue in wonder. He estimated the number of known radiolarian species at 4,314, of which he described 3,508 for the first time [my emphasis] in that single work. Haeckel’s plates are a marvel of natural illustration, though in retrospect they contain as much imagination as observation. Haeckel was so convinced of the unerring geometric regularity of radiolarian parts that he drew many perfect symmetries not quite obtained by the real beasts. This is a man who should not be dismissed in a single sentence about embryos if there’s space for more. P.S. I made this comment over on the Pharyngula Endless Thread and decided to preserve it here. The inhabitants of the earth are of two sorts: Those with brains, but no religion, And those with religion but no brains. Little has changed over a thousand years. Evolution caught in the act—again! Scientists have shown that the Italian sparrow is a newly evolved species of the sparrow family. DNA analysis shows that it originated as a hybrid of the house sparrow and the Spanish sparrow. However, it is now breeding true and is not interbreeding with the Spanish sparrow in areas where they occupy the same range. That is one of the more practical definitions of species. …this study, led by evolutionary biologist Glenn-Peter Saetre from the University of Oslo, is a genetic snapshot that appears to settle the debate.